Spirit Medical Transport, LLC, has announced another round of scholarship opportunities to those interested in becoming an emergency medical technician. However, this time the classes will be offered at either Celina or Van Wert instead of Greenville. Starting today through January 28, 2019, at 6 p.m., Spirit will again accept scholarship applications from individuals who have an interest in becoming an EMT and working full-time for Spirit once they’ve successfully completed their class, passed their national EMT test, and completed field training. The “full-ride” scholarship involves a two-year full-time employment commitment to Spirit. Application requests can be made by going online to the Spirit webpage at www.spiritmedicaltransport.com and clicking on the graduation cap or by emailing Spirit’s Human Resource Assistant Andrea Cahill at acahill@spiritmedicaltransport.com. After submitting the application, candidates will be interviewed on a first-come, first-serve basis by a member of the Spirit Human Resources department. Panel interviews of scholarship finalists will take place the week of January 28th at Spirit’s Celina office located at 316 Portland Street, Celina. Orientation night for successful applicants will be 6 p.m. February 1, 2019. Successful candidates are paid while attending the classes. The classes are a partnership between Spirit Medical Transport, LLC, and Four County Career Center based in Archbold, Ohio. Depending on the location of where most successful applicants live, will determine if the classes will be held at the Celina or Van Wert office of Spirit Medical Transport, LLC. Classes will be held five days a week starting February 25th through April 19tht. Scott Kaminski of Four County Career Center will serve as lead instructor for the class, while Mike Woodford and Scott Wolf of Spirit Medical Transport, LLC, will serve as secondary instructors. Company officials say the program offered by Spirit is unique, while mutually beneficial. 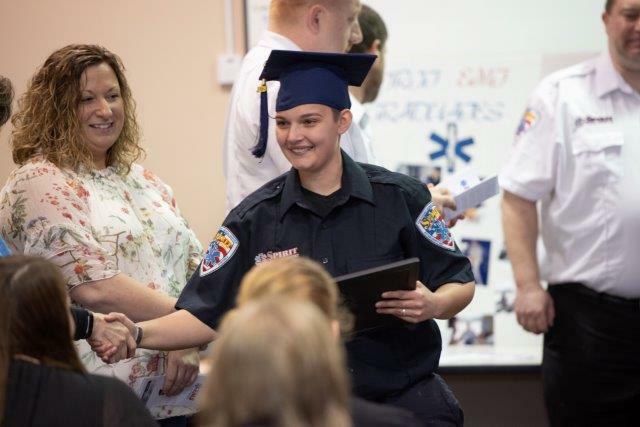 Since the program first began in August 2017, over 50 EMTs have graduated from their scholarship program. Last August, the company expanded its scholarship program to its working EMT’s, offering them a paramedic scholarship program. There are currently ten Spirit EMT’s in a 14-month paramedic program that will end in October. That class is being held at Spirit’s Greenville office, also in partnership with Four County Career Center. Hathaway said this scholarship opportunity is slightly different from ones that have been offered in the past. With offices in Greenville, Celina, Sidney, and Van Wert, Ohio, along with Liberty, Indiana, Hathaway said the scholarship is open to people who live near their respective service areas. Company officials also provide transportation assistance to successful applicants who may not live near the class location, but still have an interest in taking advantage of the scholarship opportunity.